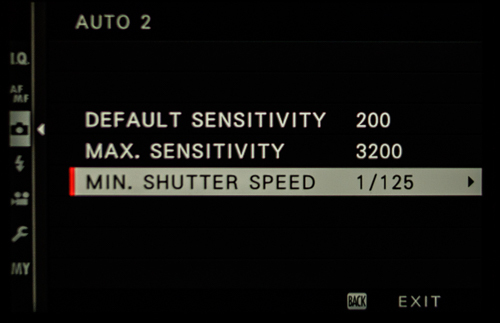 Auto ISO settings on the X-Pro2. The usefulness of having an “Auto ISO” setting became very clear to me during one of my visits to Rome several years ago now. I was shooting only with my X100 because I wanted to liberate myself from lugging loads of camera equipment around a hot (by my native British standards) city in July. I loved the way that I could be outside in the bright sunshine of a piazza one moment and then step into the darkened interior of one of The Eternal City’s many beautiful churches and the X100 would automatically up the ISO as needed. Head back outside again and the ISO was automatically reduced appropriately. Wonderful. Thank you. I could carry on shooting without missing a beat in radically different lighting scenarios. What really helped this to work so well was that the X100 had a prime 35mm equivalent lens. I could set the minimum shutter speed the camera would permit before it increased the ISO for me to something that fitted the old formula for shooting to reduce the chance of camera shake – ie 1 / <focal length>, so maybe with the X100 1/40. Applying this to shooting with my X-Pro2 is a bit more… painful. Why? Because I have a bunch of different lenses all with different focal lengths. 18mm, 35mm, 90mm, 55-200mm. If I’m using the 18mm lens I might set the auto ISO to 1/30, switch to the 90mm and now it needs to be maybe 1/125 or 1/160. Pop on the 55-200mm and… well, you get the picture. Ok, on the X-Pro2 you give me 3 different Auto ISO settings I can select, which is great – but that only allows for three different lenses assuming I wanted to use all three settings in this way. Fujifilm, when I pop a Fujinon lens onto my X-Pro2 surely the camera knows which lens it has attached? I know it does because the optical viewfinder does all kinds of clever things to adjust the framing lines according to my focal length. So… How about giving us the option to have an Auto ISO setting of “FL” – which would set the minimum shutter speed to something fitting the old rule of thumb 1 / <focal length>? You have the communication between camera body and lens to be able to work this out for me, so how about it? And on the zoom lenses you could set that 1 / <focal length> minimum shutter speed intelligently as I zoom in and out, yes? I’m going to overlook that the lens might have OIS which would change the formula considerably. Yes, your image stabilisation really is very good but for the purposes of this suggestion I’m willing to ignore it. Sure, keep all the fixed shutter speeds there too, I might want to use one of those if I have a stabilised lens attached or I have some other requirement. Would this really be too difficult to implement? And how about your other interchangeable lens cameras? I’m thinking this is such an obvious thing that surely people must have asked for it before so I’m guessing it actually must be too difficult to implement? By the way, loving your cameras! The last time I shot with a Canon body was well over a year ago now.